On 24 May 2010, BP committed $500 million over a 10 year period to create a broad, independent research program to be conducted at research institutions primarily in the US Gulf Coast States. The program will be known as the Gulf of Mexico Research Initiative (GRI).1 On 15 June 2010, BP announced the names of the scientific experts who would form GRI s independent Research Board.2 BP, in consultation with the White House3 and the Governors of the five Gulf Coastal States,4 later expanded the GRI Research Board to 20 members by adding additional scientific expertise. The Research Board is responsible for preparing this and subsequent requests for proposals (RFPs), enabling an open and transparent peer review process, selecting proposals for funding, and reviewing annual progress for continuation funding. This RFP, designated RFP I, is devoted to the selection of Research Consortia for GRI Years 2 4 (1 June 2011 31 May 2014). 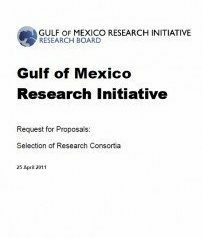 On March 14, 2011, BP and the Gulf of Mexico Alliance (the Alliance is a non profit entity formed by the Governors of the five Gulf Coastal States) entered into the GRI Master Research Agreement (GRI MRA)5. The GRI MRA creates the structure for the GRI, the selection and distribution of grants from the GRI, as well as the funding, conduct, and oversight of research in furtherance of the purposes of the GRI. Any Research Consortium,research institution, or co investigator that receives funding, directly or indirectly, in whole or in part, under the GRI is subject to and must comply with the terms and conditions of the GRI MRA. The objectives of the GRI are to investigate the impacts of the oil, dispersed oil, and dispersant on the ecosystems of the Gulf of Mexico and affected Gulf Coastal States in a broad context of improving fundamental understanding of the dynamics of such events, the associated environmental stresses, and the public health implications. The GRI will also develop improved spill mitigation, oil and gas detection, characterization, and remediation technologies. The ultimate goal of the GRI will be to improve society s ability to understand and respond to the impacts of petroleum pollution and related stressors of the marine and coastal ecosystems, with an emphasis on conditions in the Gulf of Mexico. Knowledge accrued will be applied to restoration and to improvement of the long term environmental health of the Gulf of Mexico. In general, the Research Consortia shall consist of Research Institutions in the Gulf Coast States, provided that Research Institutions outside of the Gulf Coast States may be members of or participate in partnerships with such Research Consortia, to the extent required to ensure the delivery of high quality scientific studies in fulfillment of the objectives and ultimate goal of the GRI. Click here for more information about the RFP and how to submit your Letter of Intent.